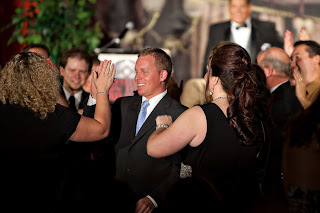 Great planning can make or break a great corporate event. 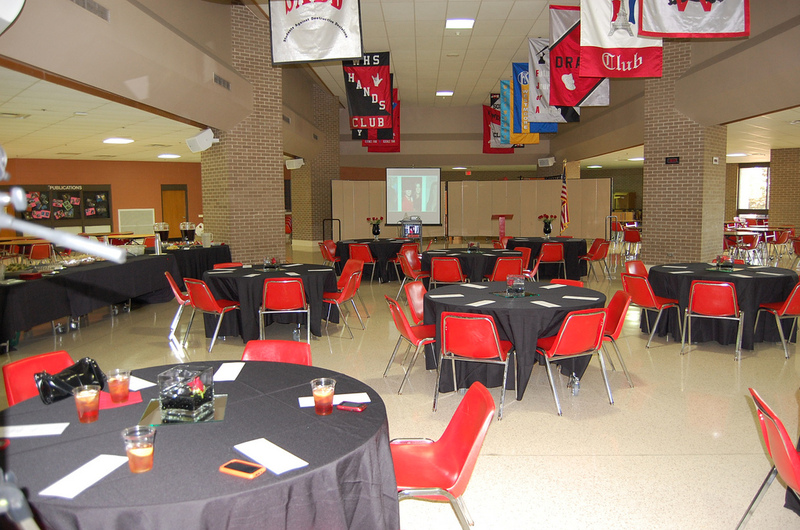 Events can grow your business or organization and bring in a lot of profits, providing a great venue to establish and develop relationships, communicate updates and news. Proper event management is important to avoid planning pitfalls so you do not wind up with a boring event or a wasted opportunity. 1. Type of Event? Is it a Holiday party, product launch, stockholder gathering, or regional meeting? The answer to that question will affect the overall direction your event will go. The event theme, budget, and venue will all depend on this. Party ideas and themes will only thrive if the event is the right type. 2. Date of Event? When organizing events, making sure the date is perfect. Brainstorm different potential conflicts and holidays that may clash with your event and plan around them. Have the guests and their travel arrangements in mind so you do not inhibit people from coming by planning it at a time where people would have to battle traffic. 3. Purpose of Event? Without having a purpose to the event, you could waste a lot of time and money for something that creates zero value. 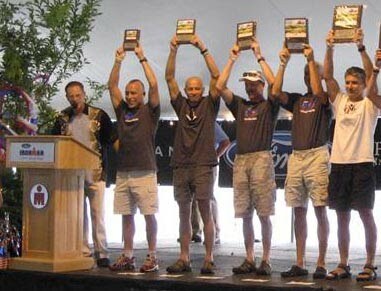 What are your goals and objectives for this event? Having a defined purpose to the event will help your planning team. Great value in fulfilling purpose of event. 4. Make sure you have the proper audio visual equipment. Having equipment with professional quality and a professional look will make your event stand out in the minds of attendees. 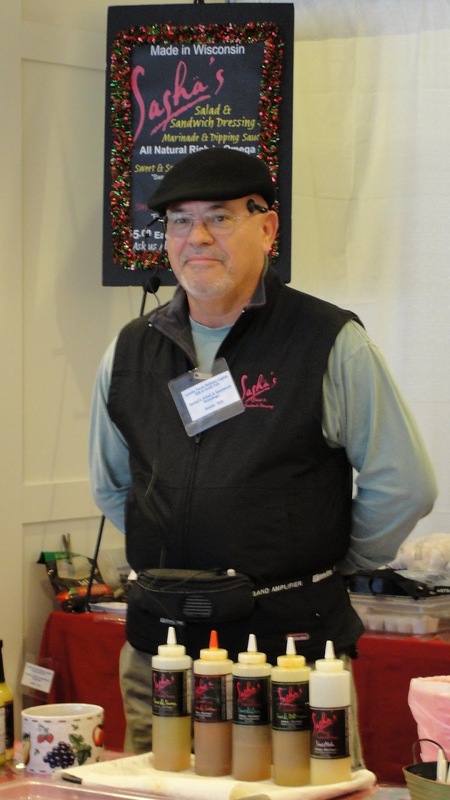 Will your event have a Keynote Presentation? Elegant events need an elegant lectern. 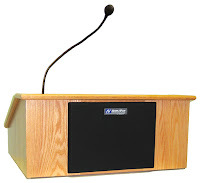 AmpliVox offers several lecterns with wireless sound systems built in, allowing speakers to project their voice over the audience. Will your event need a sound system? Do you need to project emcee's voice or play music during your event? Are there instruments that need to cover a large area? The AmpliVox Digital Audio Travel Partner Package is a great option that can project to an audience of 7,500 people through a variety of inputs: up to 8 wireless microphones simultaneously, several different music inputs (iPod, CD Player), and allows musicians to plug in their instruments effortlessly. 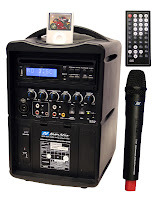 The iPod Portable PA System is able to hook up a projector and allows users to control the built-in DVD player with the remote control. 5. Does your event need entertainment? Depending on the nature of your event, it may be beneficial to hire a musician, comedian, DJ, or a celebrity for your event. Choosing the right entertainer will help boost attendance numbers and make the event a great memory for those who attend. 6. Are you expecting the unexpected? Being prepared for an emergency and having a Plan B for weather is important when planning a corporate special event. The Radio Hailer Emergency Communication System allows you to use your portable 2-way radio, base station or mobile radio to deliver live voice messages directly to a PA speaker up to 1 mile away. 7. Would signage benefit your event? This could be a valuable branding opportunity where you could increase your exposure and even include a call to action like a text-donation if you are a non-profit, or invite guests to like your Facebook Page. Signage and branding is one vital part of a corporate event that should be at the top of your checklist. Automation is a planner's best friend! 8. Automate as much as possible. Use event planning software like EventBrite or EventPro to help you with many parts of an effective event planning process for your corporate event. 9. All hands on deck! 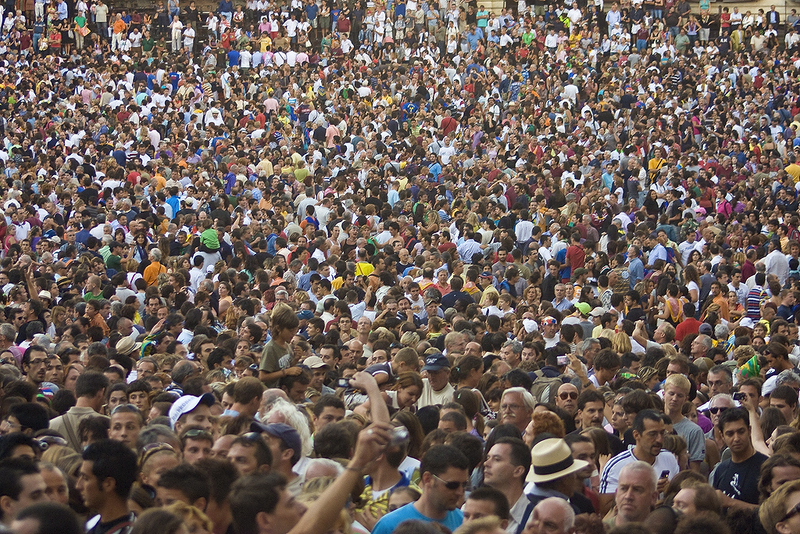 It is better to have too many people helping out at an event than too little. With potentially thousands in attendance at corporate conferences, being overstaffed is to be preferred over being understaffed! 10. Test technology beforehand to make sure it is functioning properly. Make sure all of the different systems you will be using are functioning like they should be. Also make sure the speaker placement of the PA system broadcasts your sound in the right direction to prevent embarrassing feedback that may occur otherwise. 11. Be wise about food. Do you need a whole meal or just dessert? Are you planning for certain dietary restrictions that guests may have? Party professionals need to answer these questions and find good solutions to ensure their guests safety and enjoyment of the event. 12. Pick the right time of day. Breakfast or lunch events are sometimes a better option than an evening event. A great example of this is the Business Breakfast Event called Social Media and the Art of Cause Marketing. 13. Treat special guests respectfully. If you have guests coming in to perform or give a keynote address, treat them like royalty and think through their entire schedule and how you can serve them and make their time enjoyable. 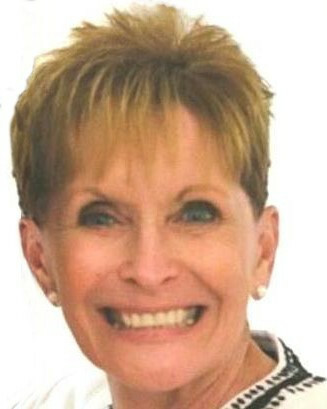 A favorable impression on the keynote speaker could pay surprising dividends in the future. 14. Be wise about downtime. Avoid boring interludes. It is a good idea to keep all corporate functions to an optimal length without a lot of downtime. You do not want people to think your event is boring, or worse--that it is over before an important announcement or part of the evening. 15. Clarify Team Roles and Responsibilities. It is a good idea for your team to review their specific duties before the event starts. You do not want anything important falling through the cracks because of bad communication or a lack of understanding. What did we miss? If you have any more corporate planner party tips or suggestions and techniques for those in event services, please share in a comment! The purpose of this blog and instructional video is to explain the wide range of features on the Digital Audio Travel Partner PA System. 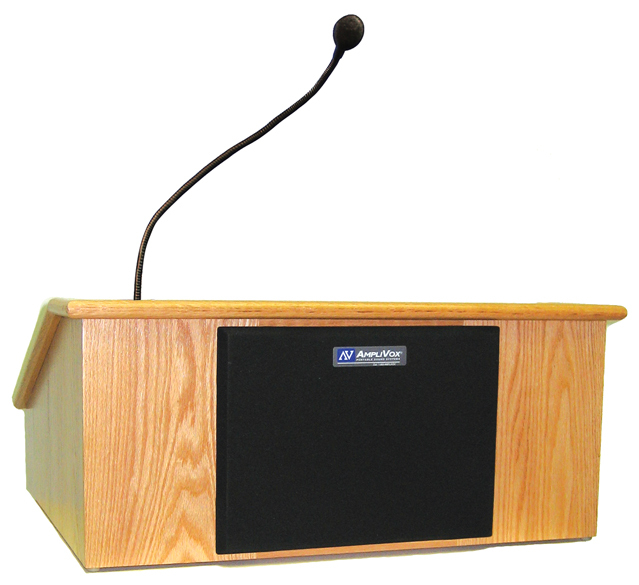 Public Address System bundles are a great way to make your voice and message heard at a large gathering. 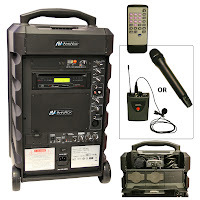 We know that some PA systems are not user friendly and difficult to set up which is exactly why we made setting up an AmpliVox Portable Sound System as easy as it gets. 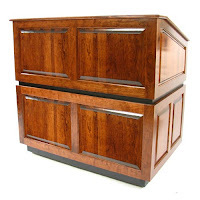 Most of our products are virtually ready to use out of the box, but this page shows how to set up some of the larger systems with more pieces. 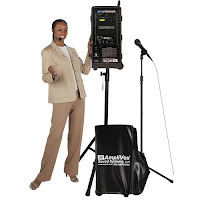 The Digital Audio Travel Partner PA System Platinum Bundle include our signature product, the Digital Audio Travel Partner PA System, and gives presenters speaker tripods, mic stands, extra speakers, and cases for the system. There are three different bundles available. 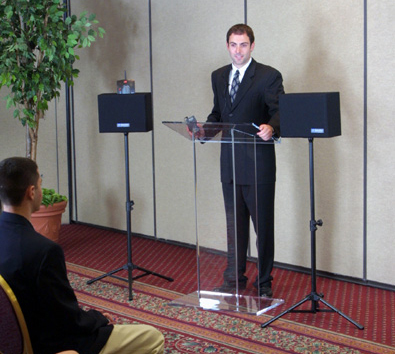 Click on the link to view an informational video on the Digital Audio Travel Partner Loudspeaker PA System. The video below explains how easy setting up a Digital Audio Travel Partner Bundle is. The Wireless Voice Projector Kit SW227 is a stereo wireless speaker system combines our Voice Projector PA System with an additional speaker, tripods for the speakers, and a case to neatly store all of your equipment. It is a 50 watt system that combines stylish speakers in black carpeted acoustic boxes in an easy to set up bundle. The video below is set-up instructions on a wired model. Sound Cruiser Mountable Loudspeaker Car PA System is a 50-watt system that extends your voice with power. It easily mounts onto your car, truck, golf cart, or other vehicle with straps and suction cups so you can easily move it from vehicle to vehicle. 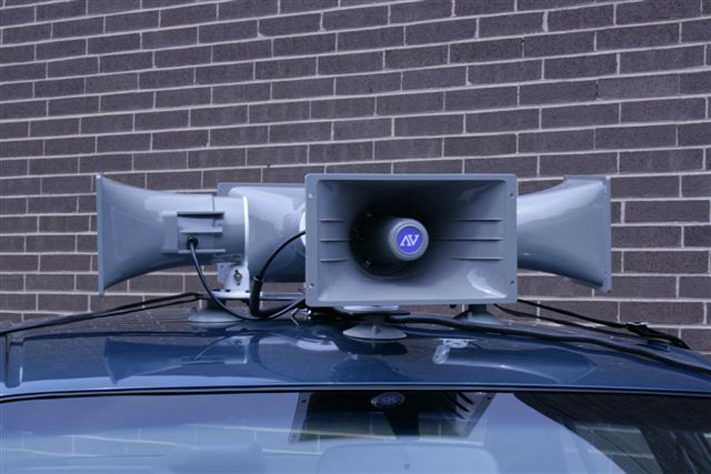 Click on the link to see an informational video on the Sound Cruiser Car PA System. AmpliVox will be at the Big Book of AV Tour! If you will be there, stop by the AmpliVox booth to say hi! 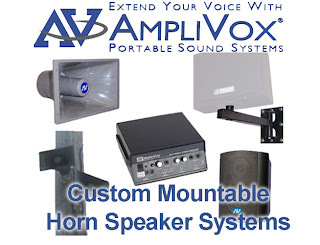 AmpliVox Sound Systems offers flexible and versatile portable sound systems that go from a 5-watt waistband system up to a powerful 250-watt system that will fill a room size of up to 25,000 square feet. Our systems are easily compatible with MP3 players (iPod, iPhone, smartphone), guitars and basses, and CD's just to name a few options. This 50-watt stereo system incorporates four Jensen Design speakers in two classy carpeted speaker boxes. With an unheard of 200 hours of battery life, a wireless range of up to 500 feet, and an industry leading 6-year warranty, this system will be a favorite of yours for years to come. The SW720 is the easiest way on the market to project your voice and iPod music! This system allows you to be your own DJ by projecting your voice over a 30-watt system and choose the music from your own iPod, iPhone, or other Mp3 player. The Voice Priority Feature makes it so when you talk over the music, the music automatically cuts out! It features a DVD video-out port which means you can connect this to a projector to project movies onto a projector screen! 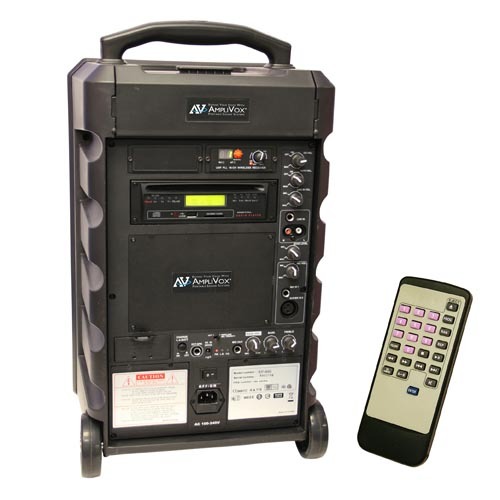 This 100-watt system has a remote control, a compartment to recharge batteries, and a compartment to easily store your presentation supplies. 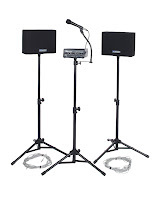 With many wireless microphone options, this is a great system for any banquet hall. 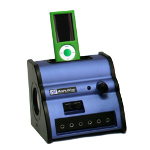 The system features a CD player with variable pitch, SD and USB slots to play audio, a case, and a one -year warranty. Click here to see a video on the Titan! This product and the next one would be great systems for live music! This system is AmpliVox’s most powerful and versatile product. 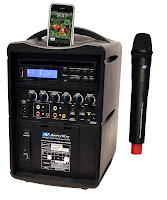 It features a potent 250-watt amplifier, a lightweight design, wireless microphone options, 3 expansion slots, and the peace of mind that comes with a six year warranty. This product has too many qualities and uses for it, please click on the product name or visit the Digital Audio Travel Partner YouTube playlist for more information. Another option is to make your own Custom PA System. Piece together your own system with our many horn and speaker options and mount them on the wall or ceiling with special mounting brackets. If you would like to purchase an AmpliVox PA System, please visit Ampli.com or call us at 800-267-5486. 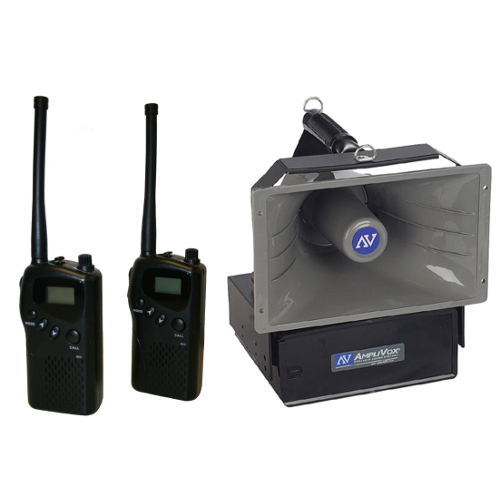 The Radio Hailer Emergency Communication System from AmpliVox is designed to allow users to be up to one mile away from the horn speaker and still communicate clearly. 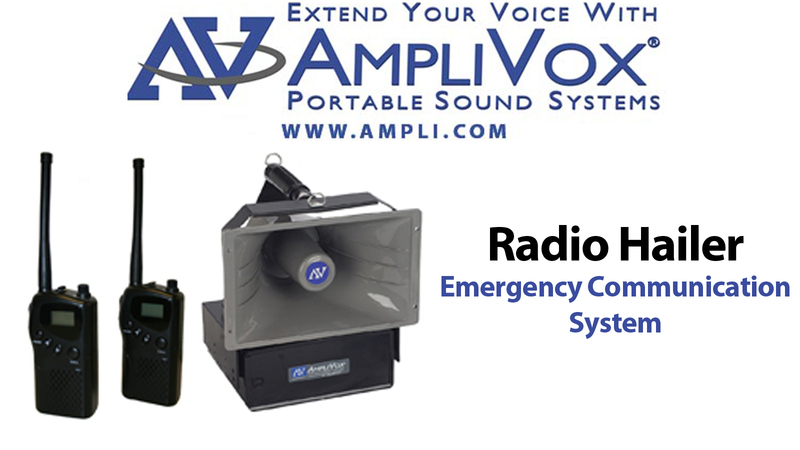 The video below showcases several sample applications for the Radio Hailer Emergency Communication System. More information on the Radio Hailer Emergency Communication System. AmpliVox is a diverse company. We make many different products that can be used in a number of different ways. Our products can be used in your neighborhood elementary school, in the event of an emergency, in a business meeting or even at a large outdoor event. 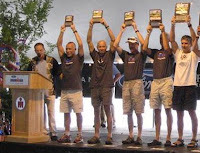 The list goes on and on and the following is a list of the top ten uses of our products. 1. Schools: In a classroom where the teacher is not up to date on the latest technology, things can get rather boring in a hurry. Here at AmpliVox we have a wide range of products that will help make learning fun and have the students get something out of school so that when they get home and they get asked by their parents "What did you do in school today?" They can say that they learned a lesson through an iPod which is rather unique. Product: SL1005 Digital iPod Audio Listening Center. 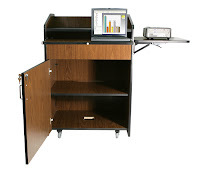 Our iPod learning center will make learning all more enjoyable and make your classroom a much more interactive one. 2. Emergencies: Our products here at AmpliVox can also be used in an emergency setting as well. In emergency situations it is important to be able to communicate with the people that are in danger or are near danger. Product: SW6200 Radio Hailer. With our Radio Hailer, the police, firefighters and paramedics will be able to communicate much better. 3. Business Conferences: We offer many products that can be used at Business type meetings and conferences. For important events such as Business Conferences there needs to be a type of podium that stands out with elegance and class. 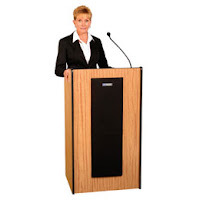 Product: Ambassador Lectern . With this product your meetings will go by Much smoother because it has a dynamic hot mic and it lets you speak up to eighteen inches away from the mic. That lets the speaker be able to focus on making the speech without having to worry about the volume of their voice. 4. Large Outdoor Events : If you are planning a big event outdoors with a large amount of people than we have the perfect thing for you! Product: SW800 - Titan Wireless Portable PA With this product the leaders of the event that is being hosted can communicate to those in attendance as well as play music. It has a simple set up and is easy to move from one location to the next. 5. Sports: Are you a coach for a local sports team and need help communicating to a large number of people? Or do you work at health and fitness club and need help communicating to a group of people while running an aerobics or workout class? Say no more, AmpliVox is here to help. 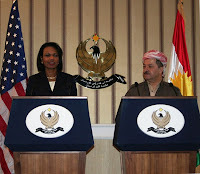 We have plenty of wireless microphones and headset microphones to make easier to communicate to your people. Product: S1658 - S222 - Audio Portable Buddy With the Audio Portable buddy is that you can be heard from 700 feet away. 6. Presentations: Do you have a big school or business presentation coming up? Not to worry AmpliVox comes to the rescue yet again. 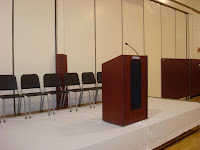 We have many options to help you choose from whether it be a lectern or a podium, whatever suits your needs best. Product: SN3085 - Clear Acrylic Tabletop Lectern. 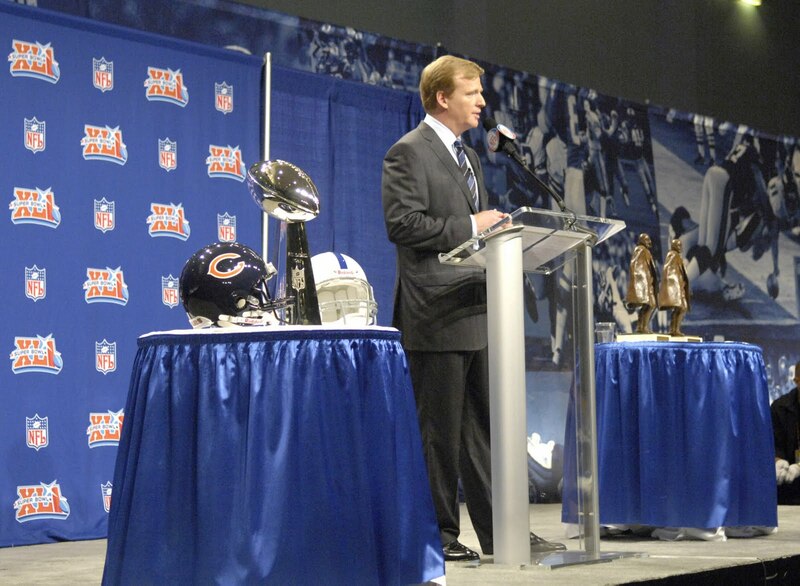 The Clear Acrylic Table Top Lectern has a very clean and clear look to it. 7. Politics: In the more recent past as politicians are making big and important speeches they have used AmpliVox products in these speeches. Politicians such as President Barack Obama, former Governor of Alaska Sarah Palin and former Secretary of State Condoleezza Rice have been seen using our podiums and megaphones in important speeches during their political careers. 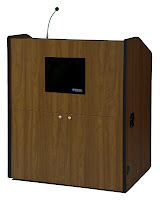 Product: SN3250 - Pinnacle Multimedia Lectern. The Pinnacle Multimedia Lectern is great to be used indoors and out, it's durable and moves easily around to wherever you need it to go. Blog: Republicans and Democrats Agree on Something: AmpliVox! 8. Ceremonies When there is a large group of people coming together to celebrate a major event, communication is important. The people at the event want to be able to hear who is talking. Product: Victoria Solid Wood Table Top Lectern SW3035. This product has a wireless sound system so communicating with a rather large audience at a ceremony of sorts will be that much easier. This product was made for the most elegant and sophisticated occasions. 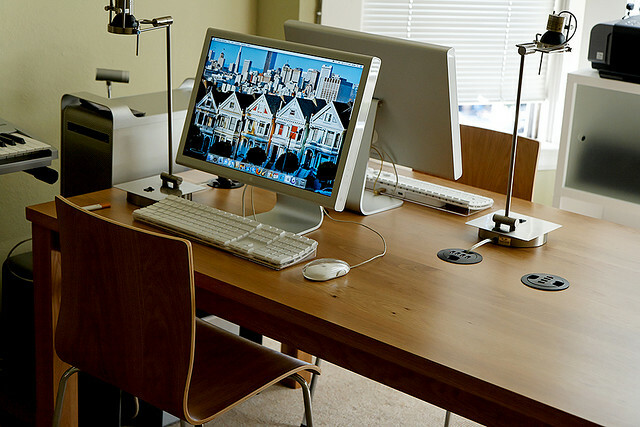 It also has a drop top reading table which makes it easy to use with a laptop or any other kinds of electronic devices. 9. Farmers Markets/Trade Shows : If you are to be successful at a farmers market or a trade show you need to be loud, energetic and enthusiastic. With the BeltBlaster strapped around your waist it makes it that much easier to be heard and get a lot of traffic to your booth. Product: BeltBlaster S206. It is lightweight and will help save your voice from getting tired after a long day of talking to customers and endorsing your product(s). 10. 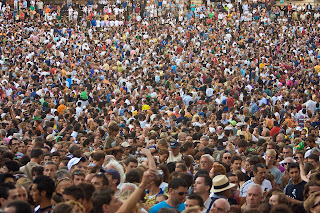 Parades: Loud, clear, crisp on the go speaking is essential in large gathering of people. Especially, in parades with large vehicles and floats moving around. Product: Sound Cruiser S312 Not only will this product help make events such as parades go by easier but it is very simple and easy to set up. It attaches to the roof of the vehicle and can be charge by a battery or plugged into the cigarette lighter in the car. 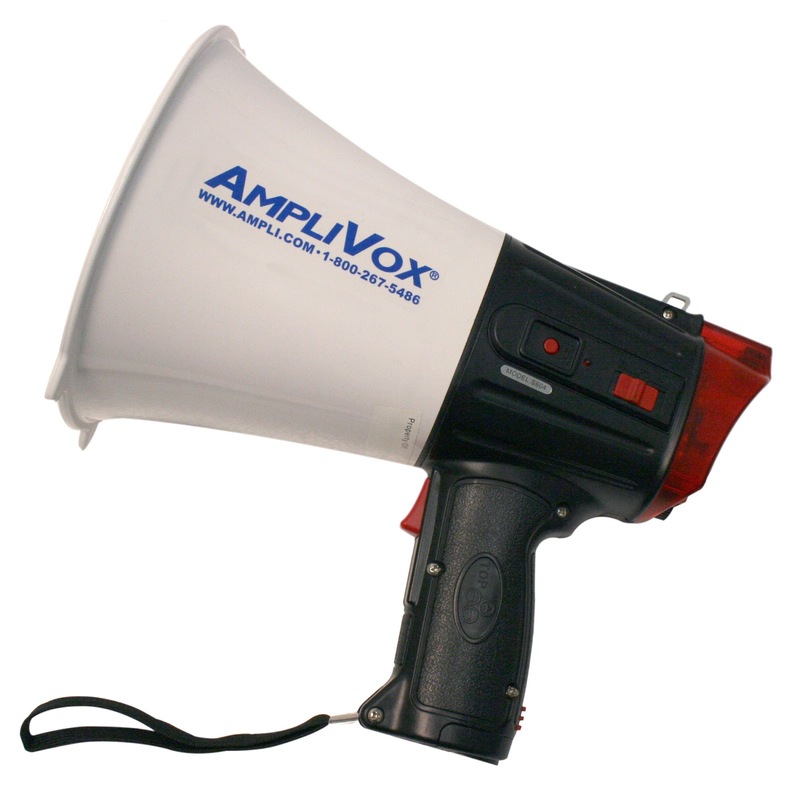 Office Communication: At AmpliVox we have many different portable sound systems. To make it easier to communicate in an office setting our portable megaphones would come in handy. If someone is not answering their office phone then to get their attention, use the megaphone. Although it may be a bit of an annoyance the megaphones we have would be very practical for your office. Product: S601 Mity-Meg 15-Watt Megaphone. Since the beginning of time the way people have learned and absorbed useful information has changed in many ways. Today's educational opportunities through new technology and abundant resources are a drastic change from previous generations. 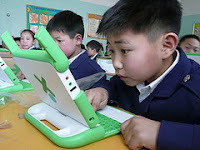 Although still used today, educational resources such as textbooks have become secondary resources next to using computers, and other technology. 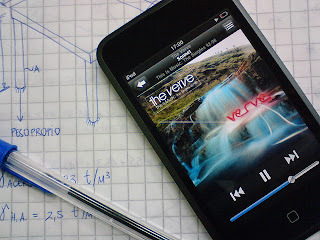 The iPod has made the way students learn in school much more enjoyable and innovative. Emerging technologies like the iPod is making the old ways of teaching a thing of the past. 1. Find The Missing Song Lyrics: Chances are you learned the alphabet through a song. That is because songs are a powerful way to ingrain words and ideas in a student's head. 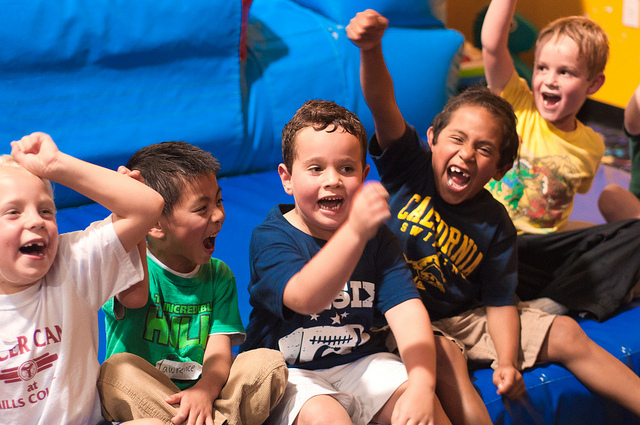 This type of activity is especially popular in foreign language classes. A teacher can put a song on an iPod in whatever the language they are being taught. The teacher then can print out the lyrics for the song, with selected words being removed, and then finally the teacher can play the song and have the students listen to the song. After they listen to the song or while they are listening they can determine the missing words to the song. 2. Audio Books: These are newer version of books on tape or books on cassette. These can be used for all types of situations. If students are maybe falling behind the others or want to get ahead and would rather listen to the book to get more out of it they can listen to the book on an iPod through headphones or a listening center. Not just individual students can use the audio books, but the teacher can make it so that the entire class does as well. This would be very practical if the teacher lost his or her voice and she still wanted the kids to read as a group. Just play the iPod through a listening center and you're good to go. 3. 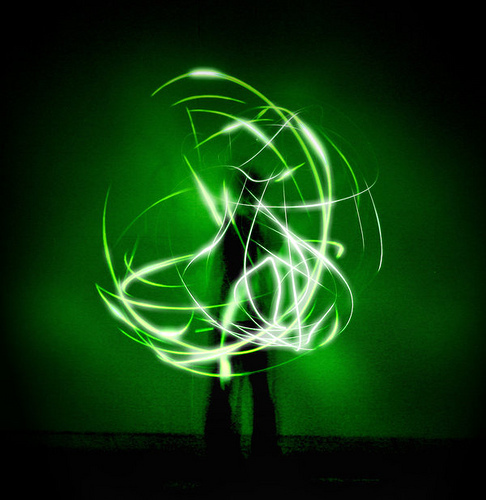 Audio Book Part 2: Do you struggle encouraging creative writing? Have the students listen to a book on tape but stop it at a certain point. Do not let them listen to the ending of a chapter or a book. 4. iPod Voice Recorder: The most natural way to develop language and pronunciation skills is through listening to proper pronunciation and practicing it themselves. The voice recorder can be used with kids that are learning a new language, or kids with speech problems. The speech teacher can record the way that the word or phrase is properly pronounced. Then, the student can listen to how it is pronounced and practice saying it the proper way. By recording themselves saying it over and over they can hopefully learn the proper way to say it. 5. 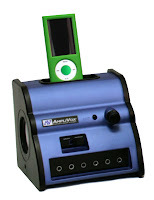 Use In an Amplified Classroom : The iPod Portable PA System from AmpliVox is perfect to be used in a classroom setting. 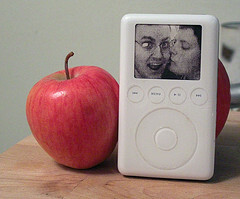 This product can be used with the iPod Touch, iPhone, iPod Classic, and iPod Nano. It is a versatile product and can be used in many different ways. One great way this product can be used is for showing a movie because it also has a built in DVD player and the system has a wireless microphone. The ducking feature allows presenters to speak over music or a movie that is being played through the PA system. 6. Study Tools: To further gain more knowledge, students may turn to study tools like iPhone Apps or Spark Notes. 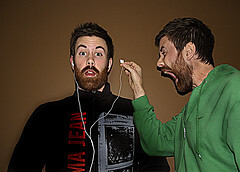 For a while they were solely available on the Internet but now they can be purchased as an iPod application as well. Study tools like Spark Notes are a good way of helping get a better grasp of what a chapter was about or get more information about a literary character. 7. 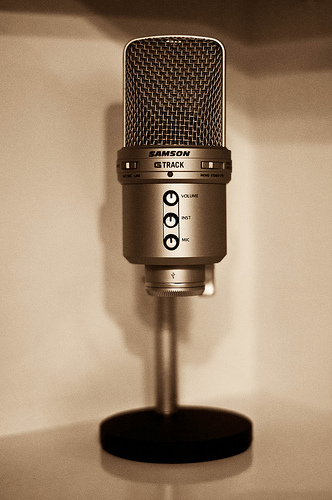 Educational Podcasts: This is especially popular with college students. Sometimes your professor talks too fast for your comfort or maybe it was just very hard to pay attention one way and did not jot everything down. Not every school does this but some schools fortunately enough some have schools have allowed professors to post the audio version of a lecture. What a useful tool this can be for students and teachers. 8. Testing Listening: Listening not to be confused with hearing, is something that needs to be taught and reinforced on how important it is at an early age. To test out children's listening skills, teachers could put a basic listening test on an iPod and have each student take it. 9. Drawing: Have your students listen to a piece of music or a song. After listening have them draw what they listened too. There is no right or wrong way to do this exercise. This would be perfect for an art or creative drawing class. 10. 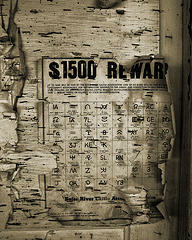 Reward: This would again fall under the category for the younger aged students. Reward the children for good behavior, good grade on a test or quiz even. Reward the student who earned the right to use the iPod and it will then encourage the other students to prepare better for the next quiz. How do you use iPods in the classroom? Share in a comment!